Maya Kaur (62) has been waiting for almost two years. Her son, Inderjeet, entered a sewer in Ghitorni in July 2017 and never came out. He was among the four people who died while cleaning a sewer in the area. While she has been hearing that the government will come to her aid, she finally saw the promises being fulfilled last week. 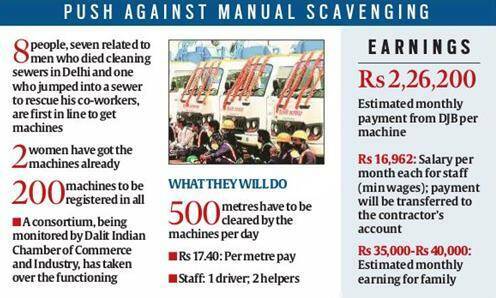 Over a month ago, Chief Minister Arvind Kejriwal flagged off a fleet of 200 sewer-cleaning machines, specially designed to enter the narrow lanes of Delhi. While 200 ‘owner-contractors’ have been picked by the Delhi Jal Board (DJB) for the project, the first eight to get the machines will be for the kin of those whose family members died after inhaling noxious fumes from sewers and one manual scavenger who escaped death in an incident at Lajpat Nagar in August 2017. Maya along with Gurmeet Kaur, whose husband also died in the Ghitorni incident, became the first two whose machines are finally off the ground and running. “The machines are working. A different company is running them for us, but we have seen the machines and have been told that we will earn at least Rs 35,000 per month from the contracts that the DJB will give us,” said Maya. The ‘company’ that she talks about is a consortium of people who have got the machines, which is being monitored by the Dalit Indian Chamber of Commerce and Industry (DICCI). “The consortium was formed because not everyone knows how to coordinate with the DJB and many are unaware of the process. Some have also received threats from unknown people, asking them to abandon the project. The consortium is helping them with paperwork and running of machines,” said R K Narra, national working president, DICCI. For 200 machines, 250 drivers and 500 helpers have been hired. They will all be paid minimum wages. “We hired more drivers and helpers than the number of machines as they need to be out on the roads everyday, as per the contract with the DJB. If some are absent on a given day, drivers and helpers can be pulled from the pool. Their salaries will be paid by the consortium,” Narra added. For Gurmeet and her son Jaspal, the arrangement is better than dealing with the DJB separately. “Truth be told, we don’t understand much of how the machines, or the contract, is supposed to work. The company is handling it for us. We have been told that we will earn Rs 40,000 per month after all the costs and it will be sent to our accounts,” Jaspal said. The DJB has also made it clear that the money earned by every allottee will be transferred directly to their accounts. “If a consortium has been formed, it is not something the DJB is involved in. The money that is earned through the contracts will be transferred directly into the accounts of the people under whose names the machines are registered. There can be no misappropriation this way,” said Dinesh Mohaniya, vice-chairperson of the Jal Board. While the project was flagged off in the last week of February, transfer and registration of vehicles happened towards the end of March. Drivers and helpers were also trained to run and operate the new machines.